It's hardly surprising that Cambridge Audio would bring out an interconnect cable to partner the successful Azur range of separates. Nor is it much of a surprise that the material value for money looks very good - a big fat (8mm-diameter) interconnect of silver-plated copper with twin screens and low loss insulation for £50 seems decent to us. It's reasonably flexible and, if you need to, it's easy enough to unzip the two channels for use with two mono amps, for instance. The phono plugs are nice grippy affairs with split centre pins. The cable itself may be bulky, but what's most striking about the sound is its airy agility. 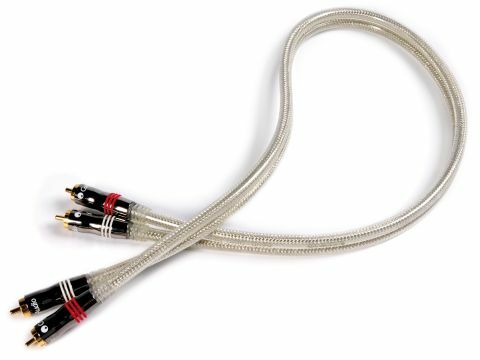 Bass is in fact very good, but the treble really stands out as exceptional among sub-£100 cables we've heard, with extension that seems limitless and superb definition of acoustic decay and physical placement of instruments. All those delicate little percussion sounds that so easily get submerged - bell tree, triangle and those small metallic things only percussionists know the correct names for - are crystal-clear and very well defined in space. High melody instruments also have an unusually natural timbre and voices are unforced and lifelike. We thought there might be just a hint of lightness in the upper bass/low midrange, but low bass is full and very well controlled, and across most of the midrange the balance seems exemplary, while rhythmic impact is good but not exaggerated.